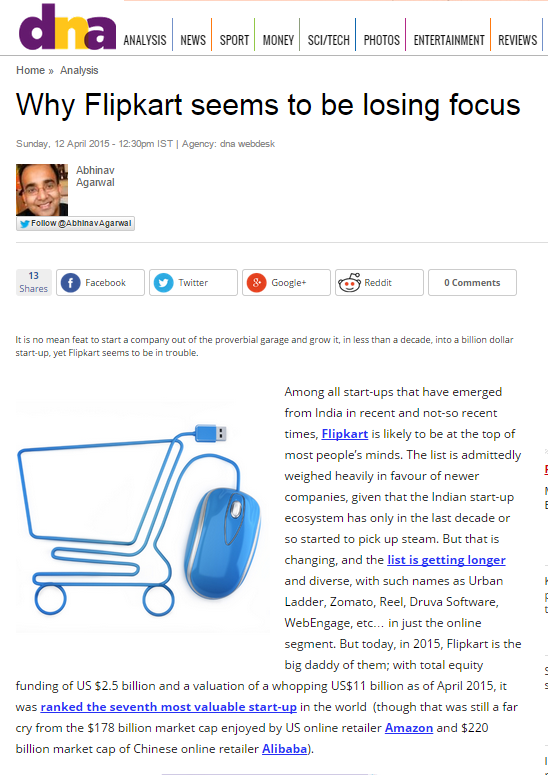 Abhinav's Tech Blog: Flipkart and Focus - 1 - Losing It? Let’s ignore for the time being the fact that it loses much more money than it makes, and that scale does not seem to have lessened the bleeding of money – it’s caught in a situation where the more it sells the more it loses,. How much of it is by design – i.e., a result of a decision to focus on scale and top-line, consciously sacrificing the bottom-line in the interim – is up for debate, but that Flipkart is a long way from profitability is undeniable. Let’s ignore this for the time being. First off, it is no mean feat to start a company out of the proverbial garage and grow it, in less than a decade (since its start in 2007), into a billion dollar start-up. And make it a leader in an industry. And do it in India. Flipkart has managed to do all that, and more. It has established, spectacularly so, that an Indian start-up can make it to the very top in a fiercely-contested space. Flipkart is, for the most part, has been a spectacularly successful start-up by most counts. Let nothing distract from that fact. So why the hand-wringing? In one word, focus. Flipkart seems to be losing focus. Three reasons stand out in my mind. First, the ongoing controversy and its decision to shutter its browser-based web site and force customers to use only its mobile app – on smartphones and tablets. It has already shut down the mobile browser site of Mnytra – the online fashion retailer it acquired in 2014. Navigate to Flipkart’s website on your browser from your smartphone or tablet and you have no choice but to download and install the app. Come May 1st, and Myntra’s website is planned to be shutdown completely! Elsewhere, there have been more than a whiff of rumours that Flipkart is contemplating shutting down its website. This seems not only quite unnecessary, but more importantly, indicative of the grandstanding that is coming to mark some of Flipkart’s actions. Shutting down the web site to become an app-only retailer harms the company in tangible, monetary terms, while benefitting it in the currency of zero-value digital media ink. WhatsApp, the world’s largest instant-messaging application and which started out and since its launch existed as only a mobile app – with more than 700 million users - launched a browser version of its application in January 2015. Facebook, the world’s largest social network, launched a browser version of its mobile app, Facebook Messenger. In case you are tempted to argue that Facebook took that step out of some sort of desperate need to boost numbers, keep in mind that Facebook Messenger had 500 million users in March 2015, before it launched its browser version of Messenger. Let’s round off with one more example: Flipboard, with more than 100 million users in 2014, launched a browser version in Feb 2015. Yet Flipkart wants to shut down its website. Is it because of technology? Limitations of mobile browsers? Well, yes, if you are still living in 2010. Half a decade is an eternity in Internet years! Small screen sizes were a big reason why apps were preferred a few years ago, where browser chrome (the title bar, address bar, footer, etc…) would eat up a substantial amount of precious screen real-estate. But in today’s world of gigantic 5” and larger screens, with HD or higher resolutions, this is a moot point. Smartphones are becoming faster and more powerful – quad-core processors and multiple gigabytes of memory are more and more commonplace, 3G is gaining increased adoption even in emerging markets as India. With the availability of UI systems like jQuery Mobile and frameworks like PhoneGap that make a web site adapt to different form factors and which provide substantial support for gestural interactions without additional coding, old arguments hold little water. Unless perhaps you are a gaming developer. Another much-touted argument is that in a country like India, most of the online usage is now coming from mobile devices – smartphones and tablets. India has been ahead of the curve – perversely thanks to its anemic and sparse broadband coverage. According to Mary Meeker’s much-watched-read-downloaded “Internet Trends” presentation at the D10 Conference in May 2012, “Mobile Internet Usage Surpassed More Highly Monetized Desktop Internet Usage in May, 2012, in India”. Indicative of this shift is the fact that in 2014 global smartphone sales overtook feature phone sales, for the first time. A little more than a billion phones were sold of each type. Most of India’s billion mobile users will move towards smartphones by 2020. However, there is, and should be, scepticism over numbers – especially that project into the future. A report that estimated the number of Internet users in India at 300 million by Dec 2014 was questioned by NextBigWhat, a “A Global Media Platform For Technology Entrepreneurs”. But with so little revenue coming from the web site, a Flipkart cannot afford to continue to maintain its website. “It just isn’t viable to have three separate platforms” - so goes one argument. But this thinking betrays a lack of understanding of the distinction between a platform and a consumption channel on the one hand and an even poorer understanding of how complex software applications have been architected for many years now (and especially those that live in the cloud). The code, APIs, database, web server, middleware, identity management, authentication, shopping cart, order fulfilment, security – all of these are common whether you are accessing a site through a website or a mobile app or a mobile browser or even via a wearable device. If you prefer techno-alphabet-soup to describe this, you use a SOA-based approach to software design. Developing a new user interface – desktop, mobile, tablet, etc… - becomes an incremental effort rather than a multi-year, multi-million dollar exercise. Yes, many technology innovations in the world of retailing are happening in a way that is inextricably intertwined with mobile – like mobile payments and hyperlocal retailing for instance. Wal-Mart uses its mobile app to guide customers to and within its stores (using location tracking via GPS). But they are not shutting down their website either. If you are in the happy situation of having too many customers, and are ok with ceding a third or more of the online retail market to your competition, then shutting down an important channel for your sales is a good idea. And no, let’s not have the argument about cars and buggies either. So why is Flipkart so obsessed, to the point of distraction, with the mobile app strategy? Customer information and its mobile search ambitions for one. See "80+ Indian startups to work for in 2015", http://yourstory.com/2014/12/top-startups-india-work-job-employee/ , "80+ Indian startups to work for in 2015", http://yourstory.com/2014/12/top-startups-india-work-job-employee/, and "India Top | Startup Ranking", http://www.startupranking.com/top/india for a more exhaustive list. "The Billion Dollar Startup Club - WSJ.com", http://graphics.wsj.com/billion-dollar-club/ - accessed April 8, 2015. Per http://www.livemint.com/Companies/nEzvGCknQDBY2RgzcVAKdO/Flipkart-India-reports-loss-of-2817-crore.html, for the year ending March 31, 2013, “Revenue soared fivefold to more than Rs.1,180 crore from Rs.204.8 crore in the previous year”, but “expenses jumped more than five times to Rs.1,366 crore from Rs.265.6 crore last year” – clearly, they were not yet at the point where they could reap economies of scale. As an aside, Flipkart’s Mar 2009 FY revenues were approximately 2.5 crore rupees - http://www.sramanamitra.com/2010/10/06/building-indias-amazon-flipkart-ceo-sachin-bansal-part-3/ - and approximately 30 crore rupees for FY 2010 - http://www.sramanamitra.com/2010/10/07/building-indias-amazon-flipkart-ceo-sachin-bansal-part-4/. "For the year ended 31 March 2014, the losses of all Flipkart India entities amounted to Rs.719.5 crore on revenue of Rs.3,035.8 crore, according to data compiled by Mint from the Registrar of Companies (RoC) and Acra. ", http://www.livemint.com/Companies/VXr8oJzNJ4daOYSO5wNETN/Inside-Flipkarts-complex-structure.html This tells us that both expenses and revenues are growing almost in lock-step – economies of scale are still elusive.